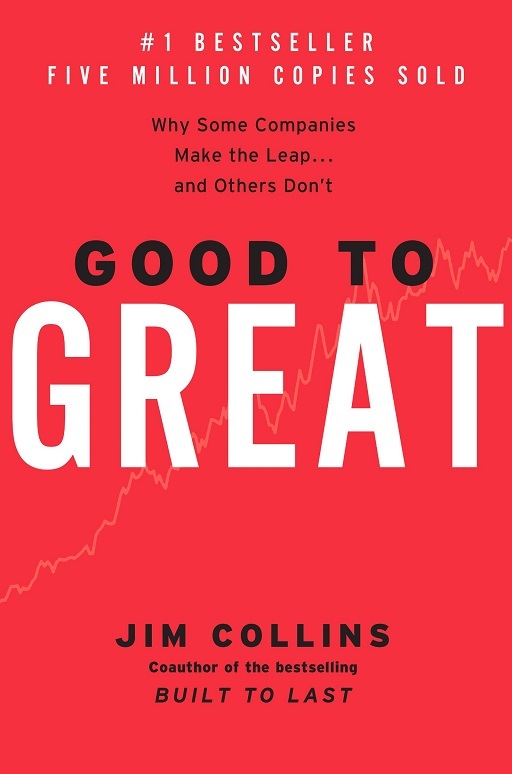 Good to Great, written by Jim Collins, consists research findings by a team on how good companies can become great companies with great financial results. 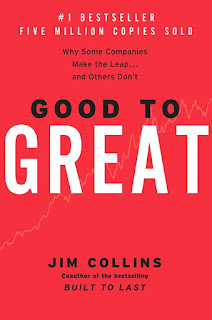 Most companies (or people) are satisfied with being good that they never become great. Bring the right people on the bus, let the wrong people off first, and then together, figure out what to do. Be open and understand what's going on, no matter how bad things are, to formulate a plan that you stick with, no matter how long it takes, by having faith that you will prevail. Be simple and focus on the intersection of the team's passion, skills, and economic returns. Give disciplined people freedom to operate within the disciplined thoughts of the Hedgehog concept and they will take disciplined action (naturally be responsible) to achieve great organization results. Technology can help to accelerate growth, but not a starter or a main driver for a great company. From good to great requires many consistent small turns/steps to turn the flywheel that represents a company's growth engine, not from a single magic bullet (person/program/product/etc). Non-consistency behaviors turns the flywheel into a doom loop that goes no where. Recommended: Yes, a must read. Buy it now if you haven't already read!